This comprehensive book reveals the evidence for intracellular calcium as a universal switch in all animal, plant, fungal and microbial cells. It shows how the components required for calcium signaling are named and classified; covers the technology that has been developed to study intracellular calcium; describes how calcium is regulated inside cells and how it works to trigger an event; explains the role of intracellular calcium in disease, cell injury, and cell death; reveals how many drugs work through the calcium signaling system; and demonstrates how intracellular calcium is involved in the action of many natural toxins. The book also illustrates how the intracellular calcium signaling system has evolved over millions of years, showing why it was crucial to the origin of life. Additionally, the book promotes the importance of the molecular variation upon which the intracellular calcium signalling system depends. Featuring more than 100 figures (including detailed chemical structures as well as pictures of key pioneers in the field), a bibliography of some 1000 references, and a detailed subject index, this definitive work provides a unique source of scholarship for teachers and researchers in the biomedical sciences and beyond. 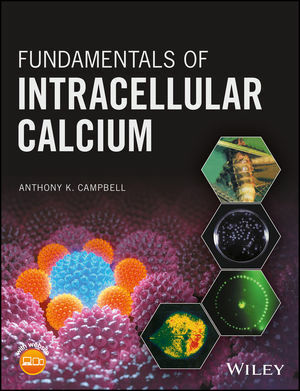 Fundamentals of Intracellular Calcium is an all-important text for post-graduate students and researchers working in biomedicine and biochemistry. It is also essential for undergraduate lecturers and their students in physiology, medicine, pharmacy, and the biosciences. Anthony K. Campbell, PhD, FLS, FLSW is Professor in the School of Pharmacy and Pharmaceutical Sciences, Cardiff University. He has studied intracellular calcium for over 40 years, and is a world authority on bioluminescence, developing the use of genetically engineered bioluminescence to measure chemical processes in live cells, particularly Ca2+. One of his inventions, using chemiluminescence, is now used in several hundred million clinical tests per year worldwide. He has published 9 books, and over 250 internationally peer-reviewed papers on intracellular calcium, bioluminescence, lactose and food intolerance, and Darwin.